About three weeks ago while rummaging a junk box at a local hamfest I saw a TPL PA3-1AE-2 amplifier in pieces in a box. I’m familiar with TPL products as I have a similar version of this amp so I knew exactly what it was. I like them as they tend to be more commercial quality amps and are fairly easy to repair. While it was in pieces it had a bag of screws and everything somewhat neatly stuffed together in the parts box. The box owner told me to make him an offer and while I stared the parts for a bit he blurted out, “How about $10?” The price sounded good to me so I bought it. 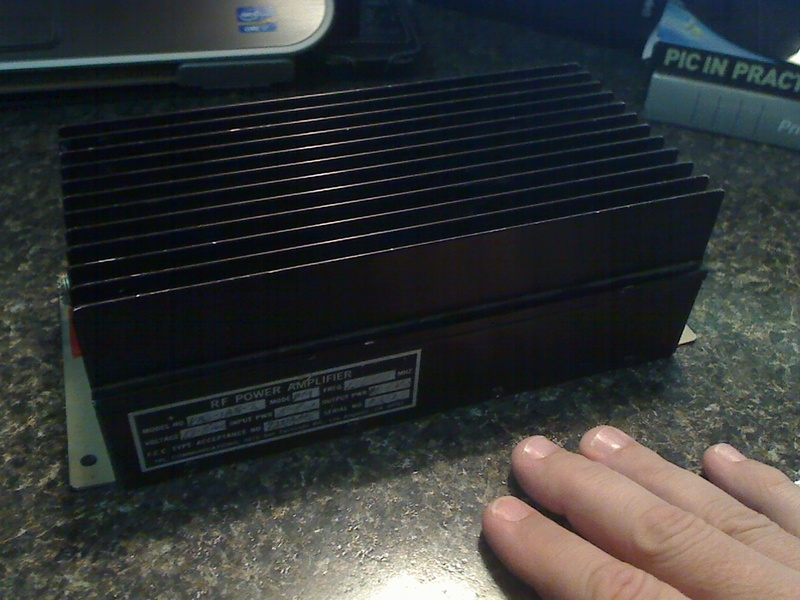 Worse case scenario… I can use the heat sink and box for something. 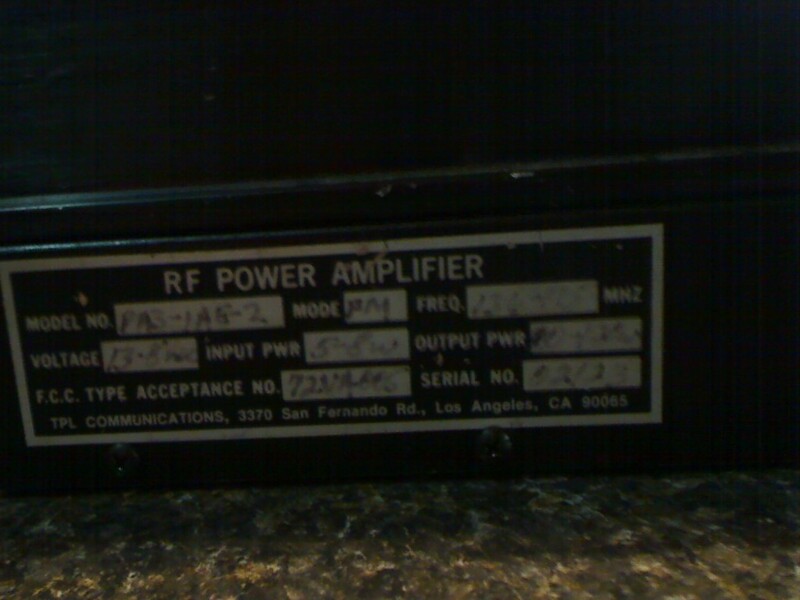 This amp if a VHF (130-174mhz), commercial quality amp. FM service only as it’s a class C. It takes 5-10 watts of drive to produce 80-120w of output. The schematics are available online but you can email me (ad7c @ arrl . net) if you need them. While I didn’t expect the amp to be perfect as it was in pieces and you don’t take a working amp apart for fun… I was a little sad to find out it had a blown power transistor. It took a while to diagnose. I lifted (un-soldered) the emitter and base of all the transistors, there are four of them, and checked them with a multimeter. This one below was bad. Failed open. I ordered a new MRF224 from eBay and I was pretty worried. 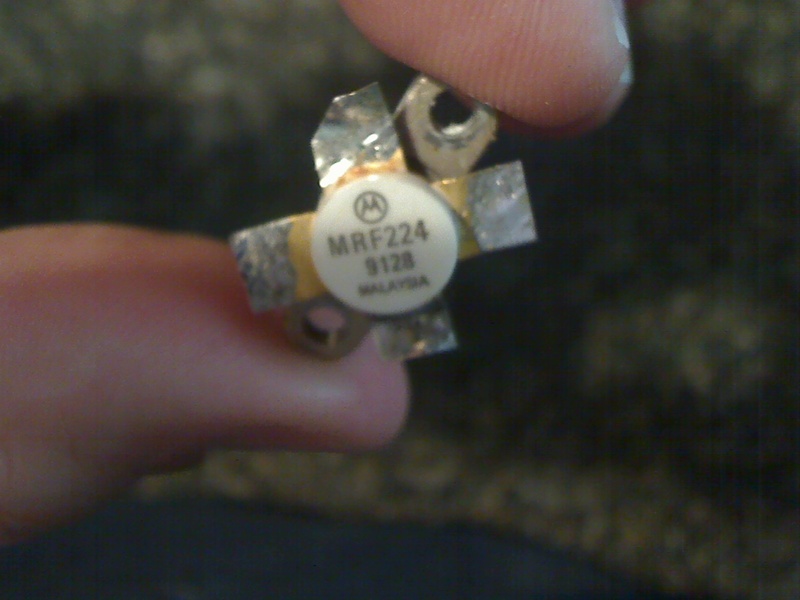 RFparts.com, a very reputable transistor supplier, wanted almost $50 for the MRF224. The one I found on eBay was $29 shipped. I was nervous about buying from a China supplier on eBay because of the rampant fake parts problem they have but I took a chance. About 8 days later my transistor arrived, I have installed it, and I now have a great VHF FM amp that I have $39 total investment. I have an old Radio Shack HTX202 that outputs 7 watts and that yielded 110w from the amp. Nice! I’ve been searching the cheap electronics on eBay lately and I ran across a couple of items that look interesting. One of those items is an Analog Devices 9850 Square/Sine wave 1-40mhz signal generator. What makes these things amazing is that they can be purchased for about $10 and that includes shipping. So… I bought one! It arrived and I was a little shocked at how small this little device actually is. I have an Arduino that I just starting tinkering around on so my hope is to get the Arduino to drive the AD9850 and see what kind of oscillator I can make. There are some other people who have already done this so I should be able to borrow some code rather than start from scratch. 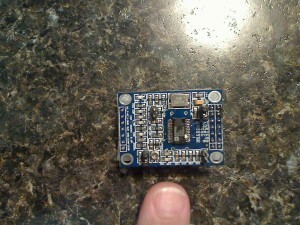 Unfortunately my AD9850 arrived without any pinout schematic so I have to track that down first.